I've searched the net and have been unable to find a solution for converting .m4v files to Windows Media .wmv files. The issue is that I'm creating audio slide shows in iMovie that I'd like to share with colleagues using Windows. If they don't have Quicktime (downloading it isn't always an option as they're on corporate systems) then they can't view the movies. Does anyone have a recommendation as to how I can either create them in .wmv format or convert them? Any help is greatly appreciated! Intro: Zamzar is a free online file conversion tool. It converts between many document, image, video, archive, audio, and CAD formats. Zamzar makes working with these and many other formats as easy as a few mouse clicks. Steps: visit their website, upload your original file (M4V), choose the format you want to convert your file to (WMV), and hit Convert. After that, wait for an email from Zamzar with a link to your converted file. Conversion time was very slow. 100MB file size limit makes it very difficult to use for video and audio conversions. The e-mail address to receive your files may be in the risk of receiving spam mails. Intro: M4VGear is a powerful iTunes M4V Converter that simply takes DRM off from iTunes M4V videos and convert them to common files such as WMV, MP4, AVI, MOV, MP3... with lossless quality. M4VGear is a standalone M4V to WMV Converter which should be downloaded and installed on your computer for running properly. It supports the latest Mac OS X EI Capitan, and the windows version is compatible with the latest Windows 10. 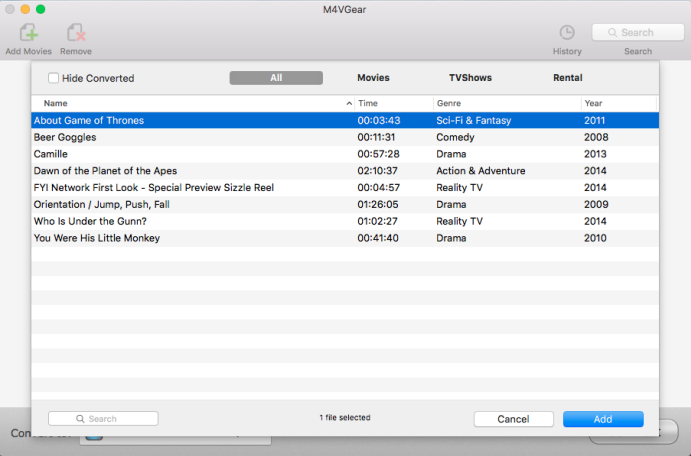 Open M4VGear, click "Add Movies" button to add the M4V videos you'd like to convert from iTunes library. You can also drag & drop M4V files to add the M4V files to M4VGear. You can either click the format logo at the end of each added video or navigate to where it says "Convert to " and choose "Customized WMV Video" in the output profile. All imported files will be converted to WMV quickly and easily. 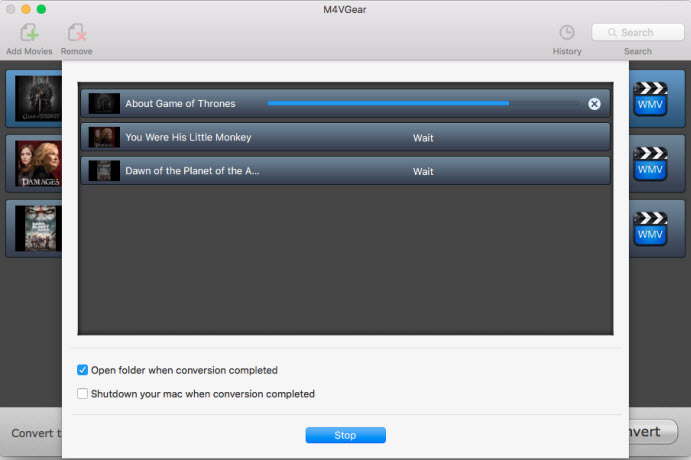 Press the "Convert" button to start the M4V to WMV conversion on Mac. A pop-up window would show you the conversion status with the process bar. After the conversion is completed, M4VGear would open the output location automatically, displaying the converted WMV videos. 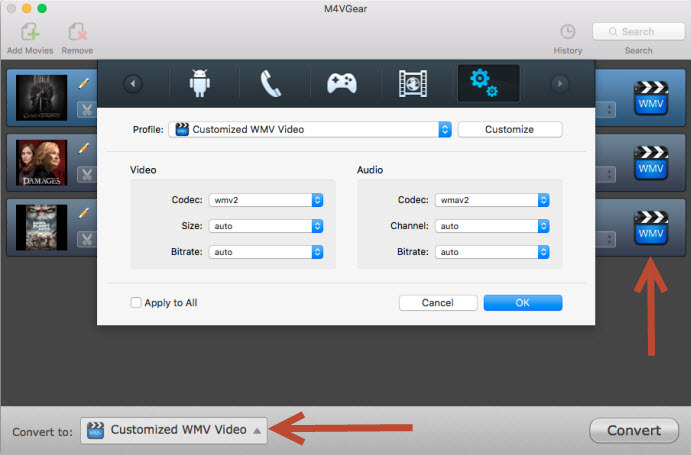 It is pretty easy to convert M4V to WMV format video with only three steps by M4VGear. For people who have lots of M4V files to convert to WMV, the best choice is M4VGear iTunes M4V Converter. It converts M4V videos in batch and gives a lossless quality to the output WMV videos. 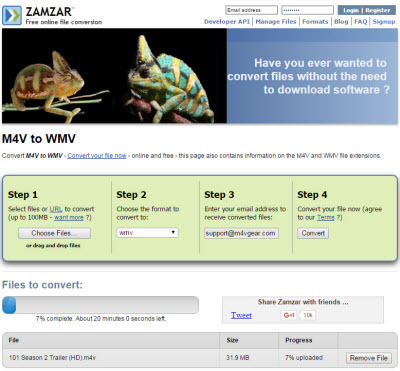 For those who don't care about the conversion speed or just have one or two small M4V files (under 100 MB) that needs to be converted to WMV, the free online M4V to WMV converter fits better. Note: M4VGear will offer you a 1-minute free trial which allows you convert one minute of iTunes M4V videos for free. If you want to unlock the restriction, now buy Mac full version with $44.95 ($49.95). Windows version is also available.